While Mussoorie is known as the Queen of Hills, Landour is considered the crown of the queen. 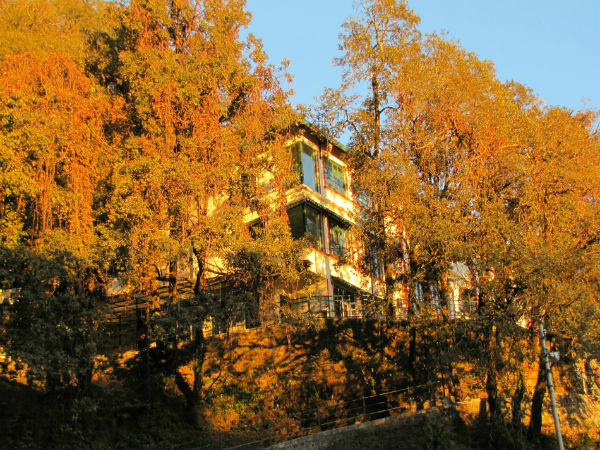 The place is home to the well-known author Ruskin Bond. The town was initially built by and for the British Indian Army in the year 1827; ever since then, the place is considered as a cantonment town. The place is wrapped up with the woods of oak, pine, deodar, cedar, etc. which further adds on to the clam atmosphere of the town. Apart from this one would across breathtaking views of a number of Himalayan ranges like the Garhwal, Swargarohini, Yamunotri, Gangotri, etc. The cantonment town can be visited anytime throughout the year; however, the months from September to June are considered as the best time to visit the place as the weather remains pleasant during these months which enables one to enjoy their stay. By Air: The nearest airport from here is the Jolly Grant Airport at Dehradun which is about 64 km from here. The airport offers excellent connectivity to a number of domestic airports, such as Delhi, Bengaluru, Mumbai, Kolkata, etc. By Train: The nearest railway station is at Dehradun which is situated at a distance of 38 km from here. The station is well connected to major towns and cities across the state and to a number of stations across the country, such as Delhi, Mumbai, Kolkata, etc. By Road: One of the best ways to reach the town is by road as the place offers excellent connectivity by roads and has a large number of buses which operate to Delhi, Dehradun, Mussoorie, etc. Landour is located at a distance of 283 km from Delhi, which would take one 7.45 h to reach via the Saharanpur-Delhi Road. One could reach the place by taking either one of these routes mentioned below. If you opt for Route 2, it would take you about 8 h to reach the place while covering a total distance of 301 km from Delhi, which passes through the towns of Meerut, Roorkee, Mohad, etc. Route 1 takes you through some of towns and industrial areas of Haryana, such as Saharanpur, Sonipat, etc. These places make for good short stops for a tea break or breakfast before you head further to the destination of Landour. The place gets its name from Llanddowror, which happens to be a village in the south-west Wales. During the British rule, it was a very common that one would find Scottish, Irish and English names to places or buildings which would reflect the ethnicity of the British. Like Mussoorie, Landour, too, has many educational institutions which were meant for the Europeans and the Anglo-Indians since the mid 19th century. One would also come across a large number of schools which are run by various missionaries. The most well-known one is the Woodstock School, which was established in the year 1854. Built in the year 1839, the Church Of St Paul is indeed a beautiful structure which conducted services to the British troops back then. The architecture of the church stands true to its Anglican base and attracts a large of number visitors. The church can accommodate 250 odd people at a single time and is surrounded by lush greenery which evokes a homely atmosphere for those visiting this place. Also known as the Kellogg Memorial Church, the structure was built in the year 1903 and was named after Rev. Dr. Samuel H Kellogg, who owned Landour Language School, which taught Hindi to the British. The church is fine example of Gothic style of architecture and houses stained glass windows. This feature along with the carvings, which date back to the period of the British rule in the country, grabs the attention of every visitor.